On November 18 and 19, I'll be speaking at ITDev Con 2010. 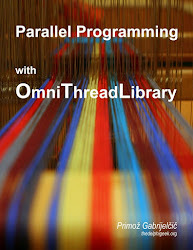 Two of my presentations will focus on OmniThreadLibrary and the third one on memory management with FastMM. All presentations will be given in English language. Just watching the replay of your presentation. Very interesting. Also what font are you using in the IDE? I'm glad you like it (presentation). Consolas 11pt (IDE).